BRUSSELS, Oct. 19, Chinese Premier Li Keqiang on Friday said China and the European Union (EU) need to collectively and firmly safeguard multilateralism and the free trade system based on rules. Li made the remarks when he met with European Commission President Jean-Claude Juncker, saying China and the EU have maintained frequent high-level exchanges. The premier said the steady and in-depth development of relations between China and the EU will not only meet the common need of both sides, but also be helpful to promote world peace and development. Noting that today's world is beset by many challenges, Li said the direction in which human civilization is heading will not change and called on the two sides to safeguard multilateralism and the free trade system. China's resolve to comprehensively deepen reforms and expand opening-up is unwavering, which is for its own development and an independent choice made by the country, said the premier. Li said China gives equal treatment to all domestic and foreign enterprises which registered in the country and will endeavour to forge a market-oriented, law-based and internationalized business environment. China endorses making improvements to the rules of the World Trade Organization (WTO), while it does not mean starting all over again, instead, such improvements must be carried out on the basis of the WTO's existing rules, said the premier. The WTO's core concepts, including the idea of free trade, should be respected. Enjoying popular support, free trade has brought peaceful development and prosperity for human beings and should be the basis for promoting fair trade, Li added. The interests of the developing countries must be fully respected and taken care of and the gap between the North and the South should be narrowed. Without solving the development issue, the developed countries will also be affected, said Li. Juncker said the EU and China are indispensable global powers to the world and shoulder major responsibility in safeguarding multilateralism. Both sides support solving problems through multilateral consultations. 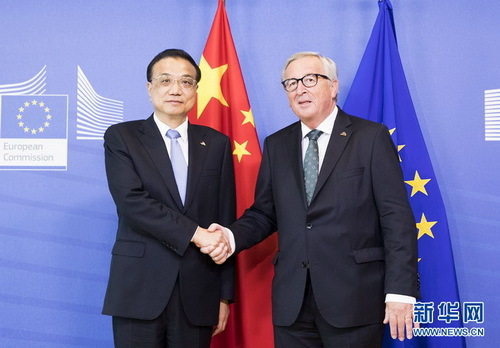 The EU and China have regularly exchanged views on the WTO reforms and agree that the reforms should adhere to multilateralism and the basic rules of the organization, said Juncker. He said the EU appreciates China's significant role in handling climate change and will work together with China to push forward the implementation of the Paris Agreement.